For my last full day, solo, in Bangkok I took the train to the weekend market early in the morning to see if I could find the lady who had sold me one wonderful top I wanted more of. It is an easy ride on the train, no stops, less than a dollar. Surprisingly I was able to found her again amidst the 7000 stalls. I wandered around a bit more, a strong ice coffee in a little plastic carrying back to keep me awake and hydrated, until I couldn’t stand the heat anymore. Returning to the train I walked against a stream of thousands, no tens of thousands of people on the way to the market. My timing had been perfect. For the afternoon I had signed up for a cooking class. After our private cooking class in Changmai last year, this was a very different experience. I counted some 25 people waiting at the assembly point. We were swiftly formed into three groups each with an instructor. We walked a few hundred meters to the mostly deserted vegetable market. We were each given a cute little basket to create the illusion of shopping for the food we were going to prepare though most was already purchased in the morning, when the market was a bit more alive and the produce fresh. Our instructor gave us a brief intro to Thai herbs as greens are called, sniffed and smelled a few and then, from a pre-arranged pile, we each took some stuff and put it in our basket and headed back to the school. Three classrooms on three floors were filled for the afternoon session. The morning session was already full and the evening session was too late for me. Our instructor was a peppy young Thai lady who had learned a smattering of Dutch (ik hou can jou, lekker, eet smakelijk), German, Chinese and other languages from her students. My fellow students were two Filipina sisters (one living in Japan, the other in Vienna), a Brit living in Malaysia with his Malaysian wife, two young German men trekking on a low budget through Southeast Asia, and a couple from Singapore. We donned our aprons and then had our class sitting on the ground, like cooking is done traditionally in most of the world. We each had a sharp knife, a cutting board and, outside the room, our own gas stove and wok. We learned how to make coconut cream and milk (not entirely from scratch), tom yum soup, fresh spring rolls, pad thai, green curry and mango sticky rice. It was more or less the same menu we had in Chiang Mai, except here two helpers did a lot of the prep work, so our cutting and squeezing and pounding was mostly giving us a feel for what it takes to get ready for the actual cooking. Only the wok part we got to do entirely on our own – a row of 9 people standing in front of stoves and the teacher on the other side giving us instructions and doling out the ingredients we had played with, plus more fillers and protein. After each menu item that we had prepared we returned to the dining area where we sat at tables and consumed the fruit of our, not so very hard, labor. It was an enjoyable experience although I was not very impressed with the green curry. My table mate also pushed it away; too salty, too much fish sauce. On my way home I had one last foot massage, splurging with the whole hour one for 8 dollars. How I will miss these. Back at the hotel I followed Axel in his plane across the Chinese Sea and then the Pacific and then the great American planes, using the Flightradar24 app which even shows the land (or water) gliding by underneath the plane. When he landed at JFK I was asleep. I had one more work call for my next assignment, one of only very few work incursions into my vacation, and then packed my bags. It is really too hot these days to do any visits to places that are not air conditioned. Still, we went to visit the Wat Pho temple complex which is worth a good sweat. And best of all, it has a massage school which was founded to make sure the Thai art of massage and ancient healing would not get lost to the tablet and smart phone generation. Part of the temple is dedicated to the art of healing massage with ancient stone tablets explaining which touch heals which body part. I had expected a large waiting time to get a massage but I was wrong, some 40 or so masseuses (presumably in training, though we couldn’t tell), in white dentist uniforms stood at the ready. The prices are a little more than at our local massage place but still little and still worth every baht. I was glad to contribute this way to the upkeep of the magnificent temple complex and the ancient art of massage-healing. We received an expert treatment and our feet, having been massaged so much in these last two weeks, are starting to limber up. I didn’t hear Axel whimper one bit. We collected ourselves at Starbucks which will forever be associated with respite from the great heat, and less so with free wifi which requires putting in your passport data and more complicated stuff when you are a foreigner. On the way home we stopped at the massage place and had a Thai massage. The last Thai massage Axel had was in Kabul when the Thai lady walking over his body broek (we think) a rib. I remember Axel letting out a fierce cry. It ahs taken more than 5 years for him to try again. It was a good experience, no ribs broken and much tightness released. At night we found another mall (all have foodcourts and airco) for dinner and had our first and one and only sushi dinner of this vacation. It was our farewell meal. A few hours later I helped Axel drag his overstuffed duffle bag (no wheels!) to the train for the airport. He left at 2:30 on China Eastern Airlines, going East to JFK via Shanghai. We whatsapped when he got there and then he settled in for his 14 hour flight and I went to sleep. We choose our hotel because of its location. Not as in nice view; we look out on the bare wall of another high rise a few meters from our window. But even if we had a view it would be of overpasses, highways and rail lines. In the streets thousands of motorcycles rev their engines as the light turns green. We are at one of Bangkok’s many grime junctions. But here is why we chose this hotel, a 3 star for 45 dollars a night (adequate, clean): we are a stone’s throw away from the express line to the airport (25 minutes, less than 1 dollar) and the subway that connects us to the Skytrain and everything that is worth seeing or doing here. And right in between the station and our hotel is a massage place with 8 dollar foot massages (1 hour) and 16 dollar whole body massage. We have become good customers. We arrived in the afternoon and escaped the heat in the food court of a mall. Words cannot describe the eating frenzy of 1000s of people and the number of eating establishments. An adjacent luxury supermarket can best be described as Whole Foods on steroids. Axel was fasting on tea and steamed rice to get his intestinal tract back in order before the long plane ride home and so I was eating alone. Making a chocie of where and what to eat took nearly an hour and then I made a series of bad choices. The food looks all great but we have learned that appearance can be misleading. I had mediocre nems, mediocre mango sticky rice. Only the green tea ice cream was great. The no-sugar diet is in shreds but I will return to it when I land in Boston. The hotel’s breakfast buffet was overpriced and not too good looking. We didn’t feel like shark fins or birds’ nests this early and chose instead to break our fast at Starbucks with their version of an Egg McMuffin and a latte. The American food and drink establishments are the new melting pots – we eat and drink and behave the same way: overpriced coffees, calorie-loaded foods and Wifi so we can consult our devices. We did so too in order to find out whether the museum would be open on Coronation Day which, in Holland, is Memorial Day and my brother’s birthday. It was. We were only able to see part of the museum. It was simply too hot and humid, even in the air-conditioned display rooms but especially in the temples. Like in other parts of the world all treasures are religious art. It makes you contemplate how much money and energy went into producing artifacts to placate the gods. Actually it still does, considering the extravagant temples and prayer houses we have seen on this trip, both in Malaysia and Thailand. The most striking room was the Javanese collection, dominated by a towering granite Ganesha. This turned out to be a ‘gift’ from the Dutch Governor-Genneral of Indonesia to King Rama V at the end of the 19th century. According to the description King Rama V was visiting Indonesia’s famous Borobudur Temple and indicated he wanted some parts of it for his collection. He sent his people up to inspect the pieces he wanted and then had them marked and eventually cut out and shipped to his palace in Siam. He was generous and didn’t take the best and most perfect parts of the temple, leaving those for the local worshippers. He did have to ask permission from the Dutch Governor-General who apparently had no trouble giving away things that didn’t belong to him or his country in the first place. I think we have evolved since then. There were countless Buddha statues, from different eras and regions, from Nepal to Sri Lanka and from western India to Japan. None were of the big bellied variety that is so familiar to us. Some of the tall stone Hindu statues, representing the many armed Shiva, reminded me of Assyrian and Mesopotamian statues I have seen in that part of the world. We realized that we didn’t know enough of the stories of Hinduism and Buddhism to fully grasp what we were looking at, just as one has to know the Christian stories to understand the art from centuries back in our musea. We left the museum after two hours. It was enough for one museum sitting. We had a nice dim sum lunch across the street from our hotel and then took a taxi to the airport express train which took us in no time over the endless traffic jams to the airport. Vietnam, here we come! Our hotel, an old Chinese opera house converted into a boutique hotel, is smack in the middle of Bangkok’s Chinatown’s most intense eating street. We had already noticed the many restaurants but at night the number is extended by 100s of street vendors with their pop up restaurants that consist of kitchen on wheels, plastic stools and foldout tables on the pavement and in front of closed store fronts. All cooking is done in plain view and the intense fires guarantee that any unwanted creatures in the food would be killed instantly. In fact the cooking fires are so intense that the woks are no longer round. We randomly selected one of the many restaurants near the hotel for lunch. Many of them advertise their shark fin and bird nest dishes, foods that we thought were outlawed, but clearly not here. We choose one that featured other dishes and ate Singapore shrimp noodles and pork-fried rice. 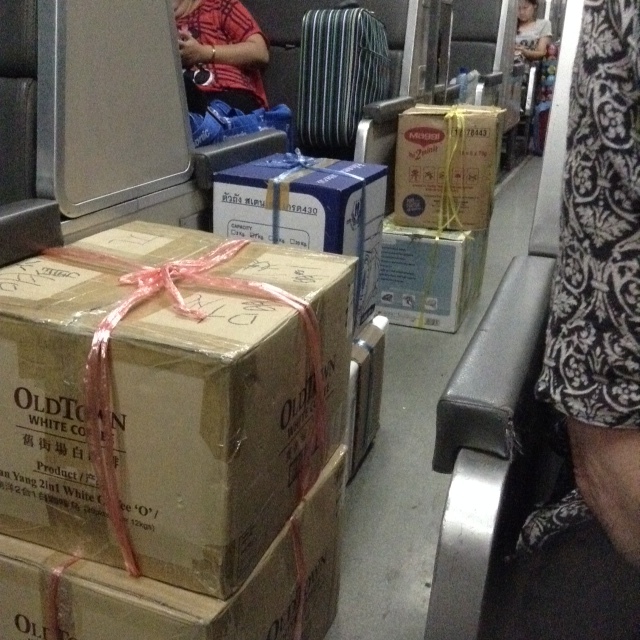 After halal Malaysia, the Chinese obsession with pork is rather striking. After lunch we retreated to our cool room as the heat and humidity were intense. We considered various ideas of what we could or should do and then we looked at our watches and realized it was getting rather late for tourist excursions and the museum had closed. The hotel has a spa and a massage seemed just the right thing to do. Because there was a staff party (a masquerade ball no less) in the evening there was only one slot left for the day, just before the cocktail hour. We took it and had a most wonderful and relaxing massage, at least I did – Axel always has masseuses work on one muscle group or another that is tight, so his massages are satisfying in another kind of way. It was the cocktail hour after that and we gave up all ambitions ‘to do’ something by sitting at a street side bar sipping a G&T and a Dr. Beam on the rocks. And then it was time for food again. The hotel provided us with a foodie foot tour in the hotel’s environs, each stop describing what was offered there in terms that made us want to eat right there. We followed the trail until we lost it and also had gotten too hot and sweaty to go on. We finally settled down on wobbly plastic stools in a side alley from where 100s of food stalls and pop up restaurants could be seen in all directions. We ordered two different prawn dishes and a vegetable one with strands of greens that looked a bit like what’s left after weeding the garden. Stir-fried with garlic, chilies, lime juice and fish sauce it became a yummy dish that gave me some ideas. All the while the water and beer we were drinking came straight out of our pores; the humidity did not let up after dark. We topped off our meal with durian ice cream – Axel had only gotten whiffs of durian but never tasted it. In Melaka we noticed it is called durian belanda (dutch durian), a combination that I don’t quite get. We weren’t quite ready to eat the real thing as they were sold in packages too big to eat in one sitting. I don’t think he will have it again. I bought a kilo of mangosteens knowing he would certainly like them with their citrusy flavor. He did. We have arrived in Bangkok. I am now past the regrets and can actually appreciate this adventure that I thought we were too old for. We are reminded of our hippy trek days – we are the age of the parents of the young trekkers with their backpacks and bronzed faces, those who are of European, American, or Australian stock. The locals are more in our age category, at least some of them. With all the boxes and cases stowed it started to get kind of cozy. Our seats already had a table put up between them with the meals we ordered back in Malaysia and two cups of tea. Axel had his remaining beer and we placed the full and empty can in the handy bottle rack until the steward told us that alcohol was forbidden. There was indeed a large sign that we had not seen. He quickly grasped the empties and squeezed them until the labels were no longer readable. The full one was pushed out of sight. A sign, next to the alcohol sign, said that inappropriate behavior would not be tolerated. We were happy about that. 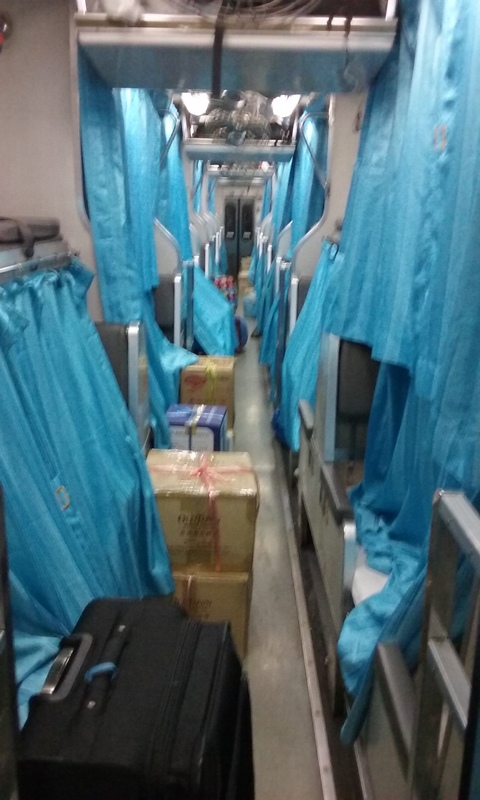 Around 9:00 PM the sleepers were prepared by the steward who moved fast through our car, lowering the upper berths and making the beds with the bedding hidden behind the folded up top berth. 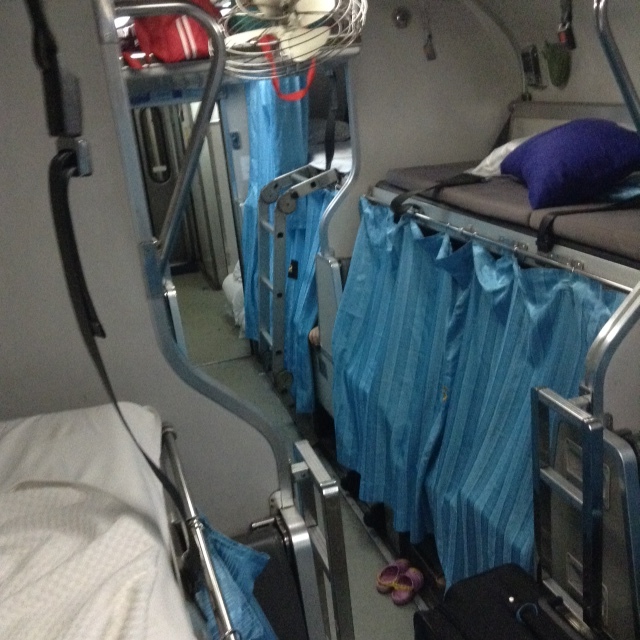 Each sleeper bed had a turquoise curtain for privacy. The number of each seat was embroidered in the middle of the curtain reminding us to creep into the right berth after a visit to the toilet. At first things were a little noisy – mobile phones went off and kept ringing when the owner had already fallen asleep. A few small children played electronic games with the most annoying sounds, but eventually everything went quiet as we thundered through the narrow landmass between the Malaysian border and Bangkok. We stopped a few times, some people got off but no one got on, except for hawkers feeding the few sleepless travelers and knowing exactly when it was time to get off the train. Cars were added or taken off judging from the loud maneuvering bumps up and down the train. The toilets were old but stayed cleaner than the toilets on Emirates’ Dubai-Dhaka flight. There were sinks for brushing teeth and washing up and a restaurant car that served meals and (non-alcoholic) drinks. A tiny galley produced food for those who didn’t want it from the hawkers. Everyone slept late – by 8:30 AM most curtains were still closed. We waited in vain for our paid breakfast and bought it again from the restaurant car when that transaction seemed not to have registered: a sandwich made from soft white bread with mystery stuff inside, two tiny bottles of over sweetened Tang and a cup of tea. A little Thai or Chinese girl entertained us for a while waiting for her grandparents to wake up. 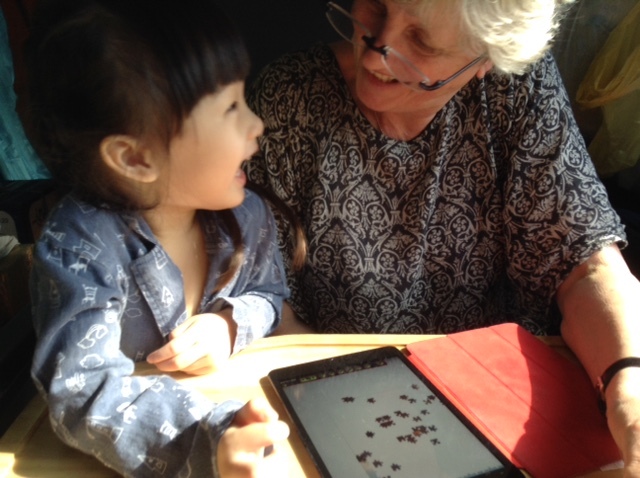 We rehearsed colors in English and she helped me with my iPad puzzle – moving the pieces with her finger to her great delight. 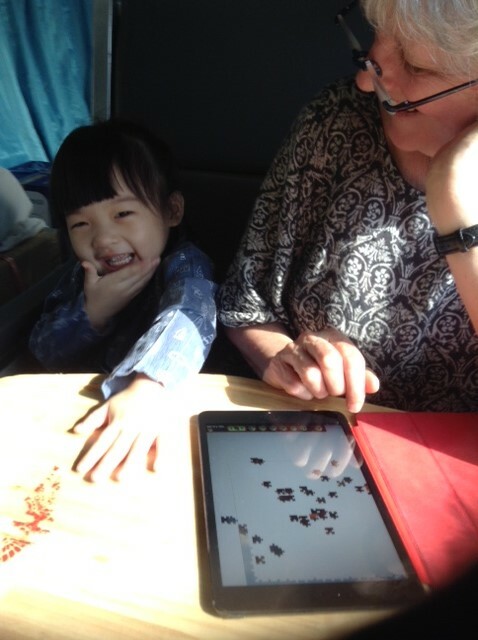 She babbled on and we talked back in English, smiling and getting smiles. I concluded that it had indeed been a great adventure. We had spent a very comfortable night, more comfortable than business class in a plane – all this in 2nd class. And now we are in Chinatown in Bangkok in the Shanghai Mansion boutique hotel, ready to have a great meal. The days are long when you are teaching with a team. Although physically more challenging (no breaks), psychologically it is easier when you are alone. You can do whatever you want when you are the only one running a workshop but is has some drawbacks: you are not helping younger staff to learn the trade and when you get feedback, if any coming your way (less and less so when you get older I notice), it is hard to digest it as you can filter out whatever you don’t want to deal with. Working with others is hard work. There are so many factors at play, and so many decisions to make. You have to think hard, all the time, before saying something in your team. You have to always consider whether one’s first reaction is a judgment about the other or reveals more about oneself. You have to consider whether you are all on the same page (oops, we forgot to spent some time on teambuilding up front) or pursuing different objectuves. Is there shame involved when not knowing or making mistakes? If you have ever watched Brenee Brown’s TED talks on vulnerability and shame or thought about your own experiences, you know it is a tricky thing. Now drape Asian and Africa cultures over these two and you have a big pickle in your hand. My objectives in the kinds of workshops I do are to move people in the direction of greater self-awareness, even millimeters is fine. Many organizational and family messes come from people not being aware of how they impact others. This means I have to practice what I preach. Being self-aware is very fatiguing as you can never criticize or judge someone spontaneously. But it is so much more fun to rant about others. So I often come back more tired from a team trip than from a solo one. The good thing of teaming is that I go out more and reduce time working alone in front of a computer and ordering room service. We went out nearly every night to nearby restaurants. For me this is a hit or miss kind of thing but for my Millenial colleagues finding a place to eat is a project that involves an internet search. They even triangulate, using trip Advisor and other sites to determine if a restaurant is worth going to. The bad places we went to where my unsearched suggestions – the good choices were based on experience, which is still my main source of information. My DC colleagues delayed their trip home, staying a few more days in Bangkok; being all warm weather creatures this was an easy decision for them. I don’t mind the snow except when you can’t land where you want to go. I left very early on Saturday morning for a three-leg, 9000 miles and 30 hour journey from hotel to home. Thanks to the combined efforts of Logan’s control tower, our Delta pilots and the drivers of enormous snow ploughs we avoided being diverted to Albany at the last minute. I tumbled into a deep sleep at 10:30 PM. It’s good to be home, snow and all.